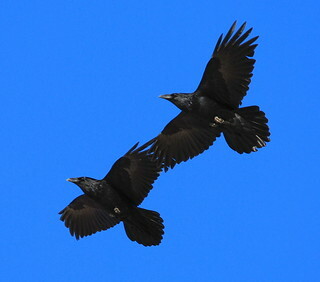 Ravens prefer to soar whenever possible rather than flap their large wings. Among other things, this differentiates them from crows. Their wings are approximately 4 ft in length or 125 cm tip-to-tip, similar to a Red-Tailed Hawk. I have often mistaken a soaring raven for a Bald Eagle at a distance. This pair are soaring into the wind regaining altitude to do more acrobatic displays above the cliffs. If it's not a windy day, they don't do acrobatics. They certainly do flap their wings if they have to, and have been known to fly hundreds of kilometers back and forth to their communal roosts in the morning and evening.